The aim of this seminar is to provide more insight into the complex world of Personality Disorders and equip the participants with more strategies for dealing effectively with challenging behaviours displayed by Personality Disordered clients. Geelong: 6 June 2019. Geelong Events Centre, Cnr Gheringhap & Myers Street, Geelong. Individuals with Personality Disorders are among the most challenging to treat of all people with mental health disorders. They may be impulsive, unstable, non-compliant, “manipulative” and self-harming. Far too often such people are managed by under-resourced services without the support or guidance of the mental health system. This situation results in poor case management, inadequate resolutions and repeated crises causing cost blowouts and stretching resources even more. 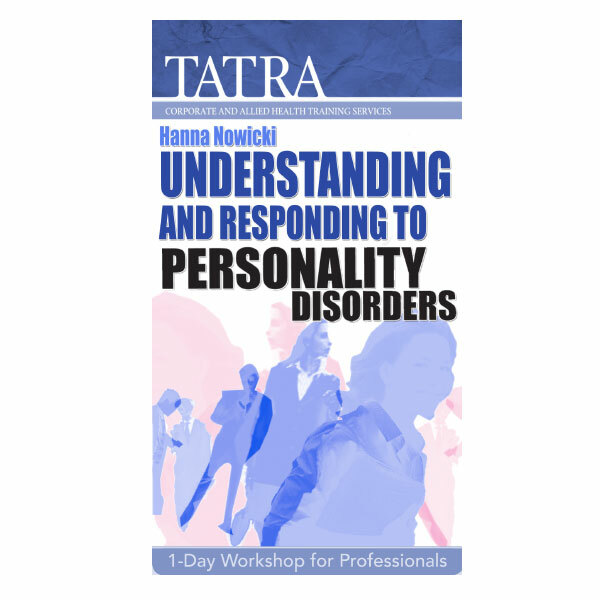 TATRA Corporate and Allied Health Training Services has developed a workshop which will foster an understanding of the specific challenges associated with caring for individuals with personality disorders. This is an interactive and fun workshop. Case studies, quizzes, group tasks and movie illustrations will be used to make this not only a valuable learning experience but also an enjoyable one. The aim of this seminar is to provide more insight into the complex world of personality disorders and to equip the participants with more strategies for responding effectively to complex behaviours displayed by clients with personality disorders. The content will include descriptions of ten personality disorders, etiological issues and, most importantly, treatment principles and strategies for assisting persons with personality disorders. The training is tailored for social workers, counsellors, nurses, housing and employment officers, community and youth workers, residential care workers, disability support, addiction counsellors and other such professionals. It has been designed to assist organisations to create best practice outcomes fast. Do not miss out! It’s a great opportunity to learn about best strategies to assist people with personality disorders and to become confident in this challenging area of mental health. A certificate of attendance will be emailed to participants following the workshop.